RAZO-HERNANDEZ, J. R. , VALTIERRA-RODRIGUEZ, M. , GRANADOS-LIEBERMAN, D. , TAPIA-TINOCO, G. , RODRIGUEZ-RODRIGUEZ, J. R.
Phasor measurement units (PMUs) play an important role in many applications of power systems. In order to ensure a reliable performance, the phasor estimation algorithm has to satisfy a set of requirements stated in the IEEE Standard C37.118.1, which establishes the test conditions and requirements for steady-state and dynamic conditions. There, two classes of performance, P and M, can be found. In general, P-class is intended for applications that require fast response and M-class is used when greater precision is necessary. In this paper, a novel algorithm based on Hilbert transform for phasor estimation in compliance with the IEEE standard C37.118.1 for P-class is proposed. Advantages of the proposal are a fast response and a low computational burden due to the HT implementation as a low-order filter of one cycle. Further, two low-complex strategies of compensation are proposed. The proposal is validated using all the test conditions specified in the IEEE Standard C37.118.1. Besides that, real voltage and current signals of an electrical system are analyzed. The obtained results demonstrate that the new proposal can meet all the requirements for P-class performance. A. G. Phadke and S. Thorp. Synchronized Phasor Measurements and their Applications. Springer, pp. 133-135, 2008. P. V. Brogan, D. M. Laverty, X. Zhao, J. Hastings, D. J. Morrow, and L. Vanfretti, "Technique for pre-compliance testing of phasor measurement units," International Journal of Electrical Power & Energy Systems, vol. 99, pp. 323-330, Feb. 2018. J. A. de la O Serna, "Reducing the error in phasor estimates from phasorlets in fault voltage and current signals," IEEE Transactions on Instrumentation and Measurement, vol. 56, no. 3, pp. 856-866, 2007. 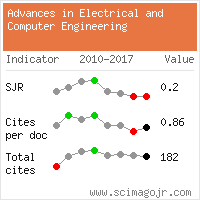 M. Valtierra-Rodriguez, D. Granados-Lieberman, J. E. Torres-Fernandez, J. R. RodrÃ­guez-RodrÃ­guez, and J. F. Gomez-Aguilar, "A new methodology for tracking and instantaneous characterization of voltage variations," IEEE Trans. Instrum. Meas., vol. 65, no. 7, pp. 1596-1604, July 2016. Cheng-I Chen and Y-C Chen, "Intelligent Identification of Voltage Variation Events Based on IEEE Std. 1159-2009 for SCADA of Distributed Energy System", IEEE Transactions on Industrial Electronics, vol. 62, no. 4, pp. 2604-2611, Apr. 2015. I. D. Melo, J. L. Pereira, A. M. Variz, and P. A. Garcia, "Harmonic state estimation for distribution networks using phasor measurement units," Electric Power Systems Research, vol. 147, pp. 133-144, Feb. 2017. IEEE Standard for Synchrophasors for Power Systems, IEEE Standard C37.118.1-2011, Dec. 2011. 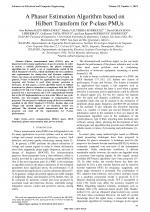 A. C. Adewole and R. Tzoneva, "Synchrophasor-based online coherency identification in voltage stability assessment," Adv. Electr. Comput. Eng., vol. 15, no. 4, pp. 33-42, Jan. 2015. P. K. Dash, K. R. Krishnanand,and R. K. Patnaik "Dynamic Phasor and Frequency Estimation of Time-Varying Power System Signals," International Journal of Electrical Power and Energy Systems, vol. 44, no. 1, pp. 971-980, Jan. 2013. P. K. Dash and S. Hasan, "A Fast Recursive Algorithm for the Estimation of Frequency, Amplitude, and Phase of Noisy Sinusoids," IEEE Transactions on Industrial Electronics, vol. 58, no. 10, pp. 4847-4856, Oct. 2011. R. K. Mai, L. Fu, Z. Y. Dong, B. Kirby, and Z. Q. Bo, "An Adaptive Dynamic Phasor Estimator Considering DC offset for PMU Applications," IEEE Transactions on Power Delivery, vol. 26, no. 3, pp. 1744-1754, July 2011. J. Ren and M. Kezunovic, "Real-Time Power System Frequency and Phasors Estimation using Recursive Wavelet Transform," IEEE Transactions on Power Delivery, vol. 26, no. 3, pp. 1392-1402, July 2011. J. Ren and M. Kezunovic, "An Adaptive Phasor Estimator for Power System Waveforms Containing Transients," IEEE Transactions on Power Delivery, vol. 27, no 2, pp.735-745, Apr. 2012. A. Mejia-Barron, M. Valtierra-Rodriguez, D. Granados-Lieberman, J. C. Olivares-Galvan, and R. Escarela-Perez, "The Application of EMD-based Methods for Diagnosis of Winding Faults in a Transformer using Transient and Tteady state Currents," Measurement, vol. 117, pp. 371-379, Mar. 2018. A. Abdolkhalig and R. Zivanovic, "Phasor Measurement based on IEC 61850-9-2 and Kalman-Filtering," Measurement, vol. 50, pp. 126-134, Apr. 2014. C.-I Chen, "A Phasor Estimator for Synchronization between Power Grid and Distributed Generation System," IEEE Transanctions on Industrial Electronics, vol. 60, no. 8, pp. 3248-3255, Aug. 2013. A. T. Munoz and J. A. de la O Serna, "Shanksâ Method for Dynamic Phasor Estimation," IEEE Transactions on Instrumentation and Measurement, vol. 57, no. 4, pp. 813-819, Apr. 2008. M. Karimi-Ghartemani, B.T. Ooi, and A. Bakhshai, "Application of Enhanced Phase-Locked Loop System to the Computation of Synchrophasors," IEEE Transanctions on Power Delivery, vol. 26, no. 1, pp. 22-32, Jan. 2011. P. Banerjee and S. C. Srivastava, "A Subspace-based Dynamic Phasor Estimator for Synchrophasor Application," IEEE Transactions on Instrumentation and Measurement, vol. 61, no. 9, pp. 2436-2445, Sep. 2012. J. A. de la O Serna, "Synchrophasor Estimation using Pronyâs Method," IEEE Transactions on Instrumentation and Measurement, vol.62, no.8, pp. 2119-2128, Aug. 2013. D. V. Coury, R. P. M. Silva, A. C. B. Delbem, and M. V. G. Casseb, "Programmable Logic Design of a Compact Genetic Algorithm for Phasor Estimation in Real-Time," Electric Power Systems Research, vol. 107, pp. 109-118, Sep. 2014. S. Das and T. Sidhu, "A Simple Synchrophasor Estimation Algorithm considering IEEE standard C37. 118.1-2011 and Protection Requirements," IEEE Transactions on Instrumentation and Measurement, vol. 62, no. 10, pp. 2704-2715, June 2013. M. G. Adamiak, A. P. Apostolov, M. M. Begovic, C. F. Heriville, K. E. Martin, G. L. Michel, A. G. Phadke, and J. S. Thorp, "Wide area protection - Technology and infrastructures," IEEE Transactions on Power Delivery, vol. 21, pp. 601-609, Apr 2006. A. Shaik and P. Tripathy, "Development of Phasor Estimation Algorithm for P-class PMU suitable in Protection Applications," IEEE Transactions on Smart Grid, vol. pp, no. 99, pp. 1-1, June 2016. A. J. Roscoe, I. F. Abdulhadi, and G. M. Burt, "P-Class Phasor Measurement Unit Algorithms using Adaptive Filtering to Enhance Accuracy at off-nominal Frequencies," in Proc. IEEE International Conference on Smart Measurements for Future Grids (SMFG), Nov. 2011. A. J. Roscoe, G. M. Burt, and G. Rietveld, "Improving Frequency and ROCOF Accuracy during Faults for P class Phasor Measurement Units," in Proc. IEEE International Workshop on Applied Measurements for Power Systems (AMPS), Sep. 2013. IEEE Standard for Synchrophasors for Power Systems, IEEE Std C37.118.1a-2014. J. G. Proakis. Digital Signal Processing Principles Algorithms and Applications. 3th ed. Pearson Education India, pp. 502-531, 1996. E. S. Gopi. Multi-Disciplinary Digital Signal Processing: A Functional Approach Using Matlab. Springer Nature, pp. 43-119, 2018. J. Ren, M. Kezunovic, and J. Stenbakken, "Dynamic Characterization of PMUs using Step Signals," in Proc. IEEE Power & Energy Society General Meeting, Calgary, Canada, July 2009. Citations for references updated on 2019-04-21 23:34 in 203 seconds.